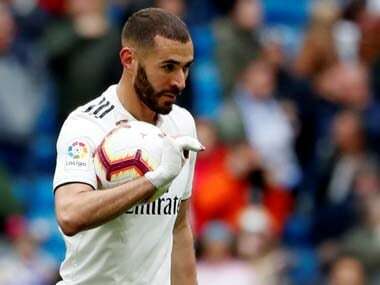 Madrid: Antonio Sanabria struck deep into stoppage time to hand Real Betis a shock 1-0 win away to Real Madrid on Wednesday as the European champions failed to score for the first time in 74 matches. Defeat leaves Real already seven points adrift of leaders Barcelona just five games into their defence of La Liga having failed to win in all three home games so far this season. Even the presence of Cristiano Ronaldo on his return from a five-match domestic ban couldn't break Betis' resistance as former Real goalkeeper Antonio Adan produced stunning saves from Isco, Toni Kroos and Gareth Bale. And Betis snatched all three points in the 93rd minute when Sanabria powered home a header from Antonio Barragan's cross. 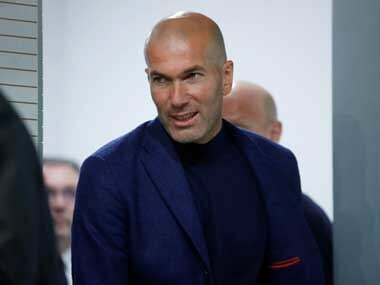 "Last year we won games we didn't deserve to and now it is the reverse," said Real coach Zinedine Zidane. "The league is very long, in the end we'll see how it goes but we need to be calm and we know we will have better days." It is the first time Betis have won at the Bernabeu since 1998. "It is impossible to win here without suffering," said Betis boss Quique Setien. "To win against a team like this, your goalie has to have a spectacular game and you have to have luck." Ronaldo was recalled among three changes to the Madrid side from Sunday's 3-1 win at Real Sociedad as Zinedine Zidane named his strongest available side. However, it was the visitors who made the stronger start and should have gone in front when Sanabria's goalbound effort was cleared off the line by Dani Carvajal. Keylor Navas also produced a stunning save to tip Fabian Ruiz's rising drive over the bar. At the other end, Adan made a smart stop to deny Isco just before half-time and Betis had to resist an onslaught after the break. Ronaldo blazed wildly over from Bale's inch-perfect cross before Kroos forced Adan into another finger-tip stop. 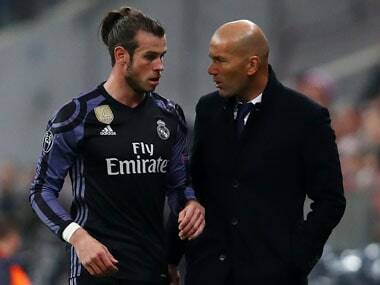 The former Madrid 'keeper's finest moment came in denying Bale in spectacular fashion 15 minutes from time, though, as the Welshman's backheeled volley was turned onto the post. Betis were the side to finally have the ball in the net as the game entered five minutes of stoppage time, but Sanabria had strayed offside as he turned home Andres Guardado's shot. However, they broke with purpose once more minutes later and this time Sarabia wasn't to be denied as he bulleted a header into the far corner from Antonio Barragan's cross. Earlier, Atletico Madrid celebrated being awarded the honour of hosting the Champions League final in 2019 with an impressive 2-1 win at Athletic Bilbao to move up to third. The visitors needed to rely on a brilliant penalty save from Jan Oblak to deny Aritz Aduriz just before half-time. Angel Correa opened the scoring 10 minutes into the second-half by finishing off a flowing move involving Antoine Griezmann and Saul Niguez. And Yannick Carrasco secured the three points with an angled finish from another Griezmann through ball 17 minutes from time before Raul Garcia netted a late consolation for the hosts. UEFA awarded their showpiece event for next season to Atletico's new Wanda Metropolitano earlier in the day. And the feel-good factor around Atletico following their 1-0 victory over Malaga to open their new 68,000 capacity home at the weekend continued with a commanding display in their fifth away trip in six games so far this season. "It is another important step for the club. Hopefully, on the field we can match the growth of the club," said Atletico coach Diego Simeone. "We are making an enormous effort. We have played five games away from home and the response has been positive." Sevilla moved into second, two points behind Barca, as Jesus Navas scored the only goal of the game in a 1-0 win over Las Palmas. Alaves remain without a point or even a goal after five games as Luisinho's winner handed Deportivo La Coruna a 1-0 win for their first victory of the season. Leganes stay in the top half after a 0-0 draw at home to Girona.